fffabulous - fffaqs: should I get these coclico miner boots? fffaqs: should I get these coclico miner boots? I was actually hoping I could get your opinion on a pair of boots! I found them when I was checking out those booties you listed the other day, and I have not been able to stop thinking about them. The link is: http://www.habitatshoes.com/see/coclico/miner. 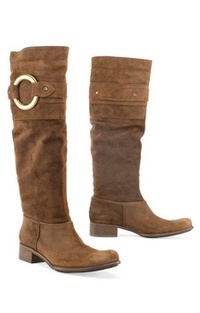 They look like they would be great for fall, and are on sale, so I am having a very hard time resisting them! I just wanted to get the opinion of another fffashionista. Thanks so much for your email and for reading fffabulous!!! I checked out these Coclico Miner Boots, and I think you should totally get them!!! Here is why (it's always good to be rational in those moments, right? ): 1. flat boots are SO in this season, you'll get to wear them ALL the time; and the cool thing about flat boots is that you'll be able to run around without them ever hurting your feet or back; 2. suede is in this season, too; 3. I love the gold hardware detail on the side; this gives it a nice touch; 4. The price is really good (and it's on sale too! ); I don't think you'll find another pair of boots like these ones at that price anywhere else. I'd get them if I were you! Enjoy your boots and please drop us a line soon to tell us how much you love them! P.S. : Habitat Shoe Boutique is having a 20% OFF Sale on Chie Mihara & Coclico for the ladies, and on Camper & Tsubo for the gentlemen, October 27 to November 2 only. Enjoy!